The Oklahoma Real Estate Commission administers its own examinations for both a sales associate and a broker. The exam is comprised of both national questions and Oklahoma state specific questions. Before being eligible for an exam, you must aquire approval from the Oklahoma Real Estate Commission by submitting an application. Your application is where you submit your education and experience requirements. The application must be notarized. Once approved for the Oklahoma Real Estate Exam by the commission you can take the exam on a walk-in basis. The sales associate exam is 3 hours long and the broker exam is 6 hours long. In Oklahoma if you pass the real estate exam your score is valid for 90 days. The Oklahoma Real Estate Broker exams are taken on computers. The exam is closed book. You are permitted to bring a simple functioning calculator for the 10% of the exam questions that might involve math. 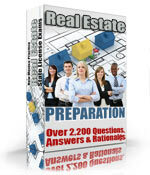 The registration fee to take the Oklahoma Real Estate sales associate exam is $60.00. The registration fee to take the Oklahoma Real Estate broker exam is $75.00.